Happy Saturday! I titled this post Mellow Yellow because I am doing my best to stay mellow and calm. My son has a bad case of the terrible two’s and is driving my husband and me crazy! I am trying to be mellow and I thought this yellow shirt would help the situation and bring a little sunshine to my mood. 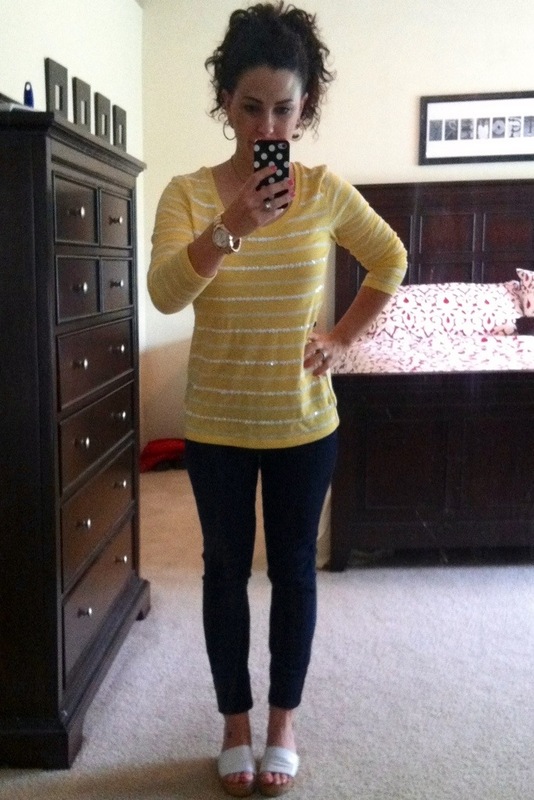 After two months of OOTD posts, I realize I have somewhat of a go to formula or uniform for getting dressed – wedges, skinny jeans, and a t-shirt. I am not a glamorous dresser, I don’t have anywhere to go to get dressed up. I try to be practical, cute, and comfortable in my clothes. I think I have succeeded for the most part. If you are looking for high fashion and cutting edge trends, this probably isn’t the place for you! Dark skinny jeans – Forever21, bought several years ago. I wear these all the time and they are awesome! I think I paid $12 or so for them and they were well worth it! White cork Steve Madden wedges – Macy’s, bought several years ago. I feel like I can stand all day teaching in these shoes, chase my son, or if I ever decided to run, I truly believe I could run in these shoes! 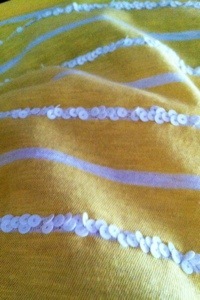 Yellow embellished striped t-shirt – Old Navy, bought yesterday for $4. If you like long sleeve and three-quarter sleeve shirts, stop what you are doing and go to Old Navy right now! I went there yesterday to exchange a few items for my son and ended up buying myself five shirts! Each shirt was under $5! I hope your Saturday is mellow and sunny! Mine has actually been pretty good, just a few battles with a stubborn, almost two-year old!